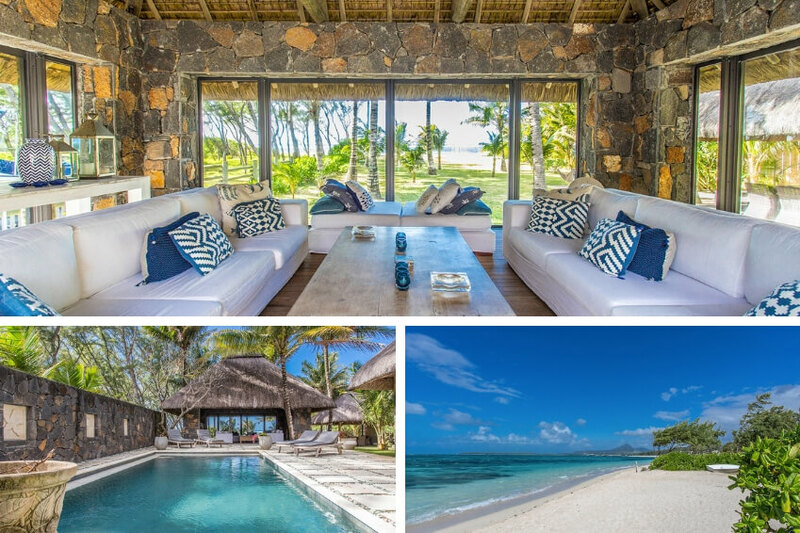 The cold settles, the winter is coming ... Villanovo distributes you a little bit of heat by offering you its selection of 8 exceptional villas in Mauritius, perfect winter destination. Imagine your feet in the water, on one of the hot sand and clear waters beaches as a garden, or lying on a mattress shaded by coconut trees, all accompanied by a house staff making sure to answer to all your needs. 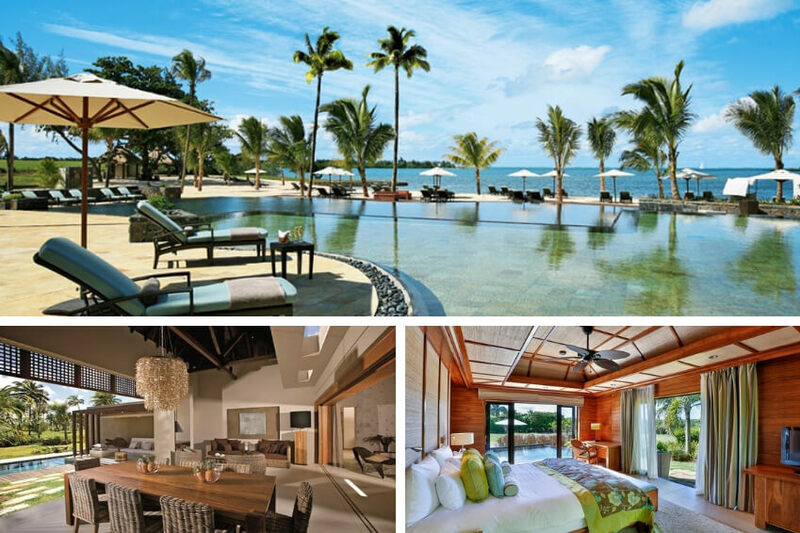 This is not a dream, it is the promise of Villanovo in its most exclusive villas in Mauritius. But the luxury dimension makes even more sense with a prestigious house staff, who strives to deliver the best in terms of tailor-made service. Its qualified butlers will be at your disposal for the influx of the slightest need. As for the rest of the staff, it will also provide you with a unique experience, more specifically a local knowledge: a concierge service bringing together, as always, experts of destinations, as well as a chef 24/7, who will make you taste the a thousand flavors of the island. >>> Discover the villa Saint Regis by yourself, pictures often speak better than words. 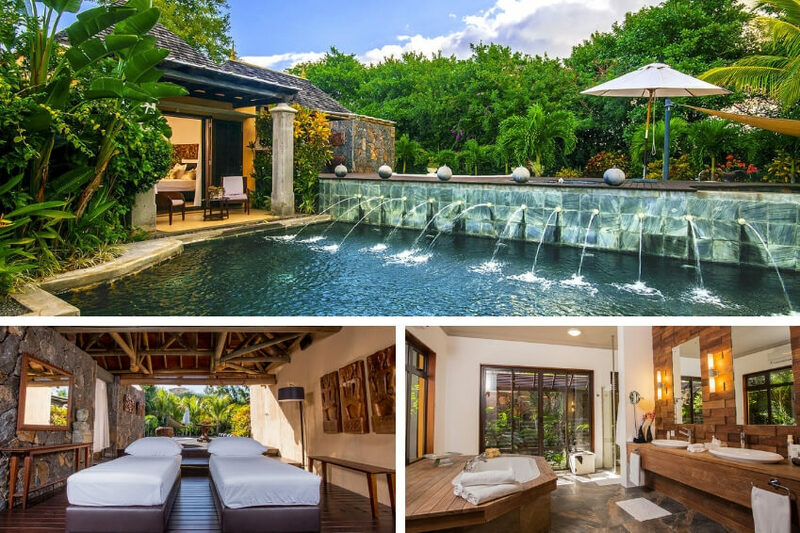 The villa Anahita is perfectly nestled in the Mauritian nature, where the blue lagoon of the Indian Ocean laps gently on the shores to the east of the island. It is in an authentic environment, but also refined and unique that you will spend your holidays. In addition to its sumptuous appearance, this property is conducive to the many activities offered by the island, for days rich in emotions: Start your morning with a dip in the beautiful lagoon as a garden, at lunch time, share a picnic on Ile aux Cerfs before challenging you around a game of golf or tennis on one of the courses of the villa or relaxing in the spa. Finally, end this perfect day enjoying a sumptuous sunset over the ocean, from 213 acres of tropical gardens. >>> Discover the villa Anahita! Located on the banks of the Black River, Villa Tamalia is one of the most luxurious properties of our selection in Mauritius. Its large relaxing spaces, offer you comfort and intimacy. Everything is implemented and at your disposal to meet your expectations: 2 pools that can be cooled or heated on request, a staff who will take care of you and can prepare your favorite cocktails with the bar housed by the house, and you will also find a sauna, steam room, jacuzzi and fitness room for an absolute well-being. It is a luxury experience, certainly, but also in the middle of nature. 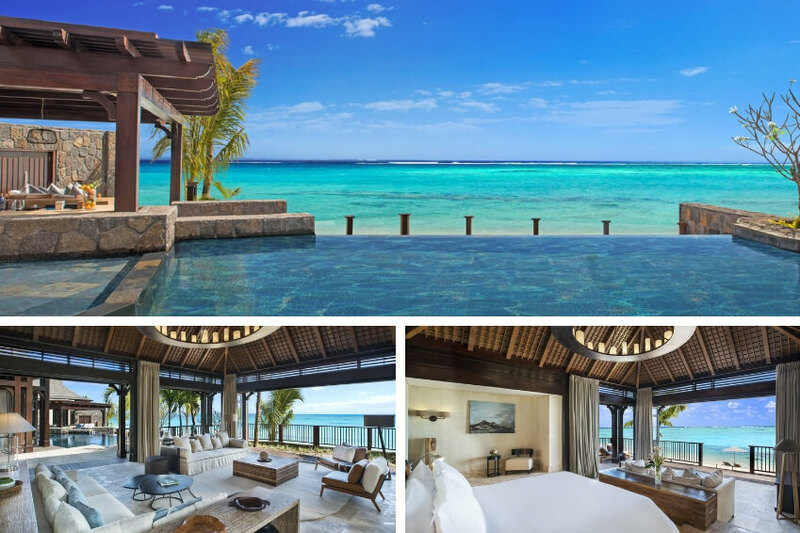 You will be surrounded by the tropical beauty of Mauritius, in an enchanting environment. The villa Tourmaline is a property with undeniable charm. Thatched roof, white sand beach, turquoise lagoon ... Criteria answering, with no doubt, to a paradise setting. Numerous dense openings allow the nature of the beautiful outdoor setting to be introduced inside the villa, in the middle of a neat decoration embellished with exotic wood furniture. 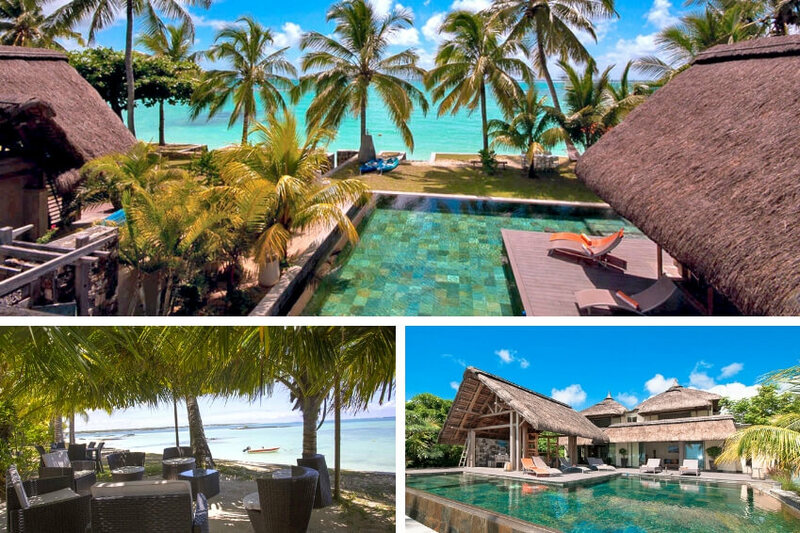 In addition to its dreamy setting, it is ideal for your family holidays: its garden under the shade of coconut trees is ideal for energy-rich children wanting to let off steam, its location by the sea, feet in the water , will delight lovers of kitesurfing and scuba diving, its spa treatments will satisfy those seeking relaxation. >>> Book your family holiday in the villa Tourmaline without waiting. The villa Heaven is aptly named: it is a paradise, where the phrase "stay by the water" makes sense. Here, your garden is simply the warm white sand beach of Mauritius. 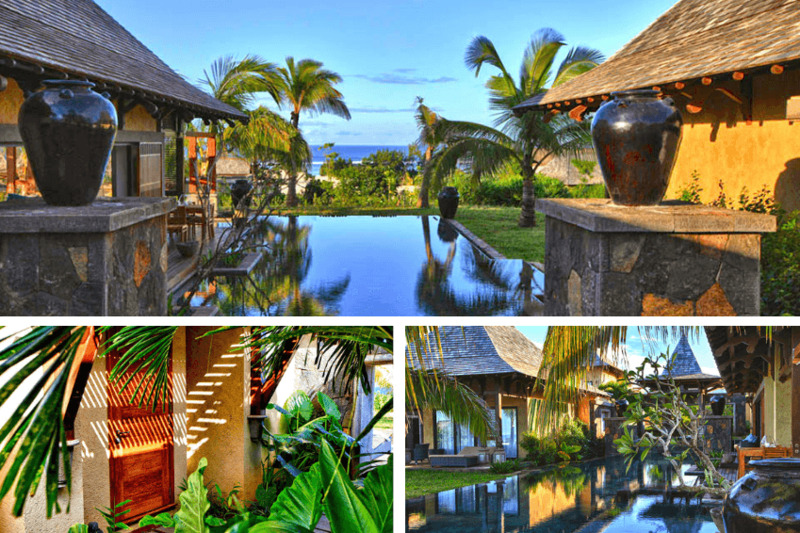 Located on the beach of Belle Mare, this property has an exceptional panorama of the turquoise water. We let you imagine the magnitude of the sunsets ... With a capacity of 6 people, you can spend holidays in privacy, and practice family activities such as venturing on the transparent waters aboard the kayaks provided by the villa or indulge in a round of golf with its nearby terrain. 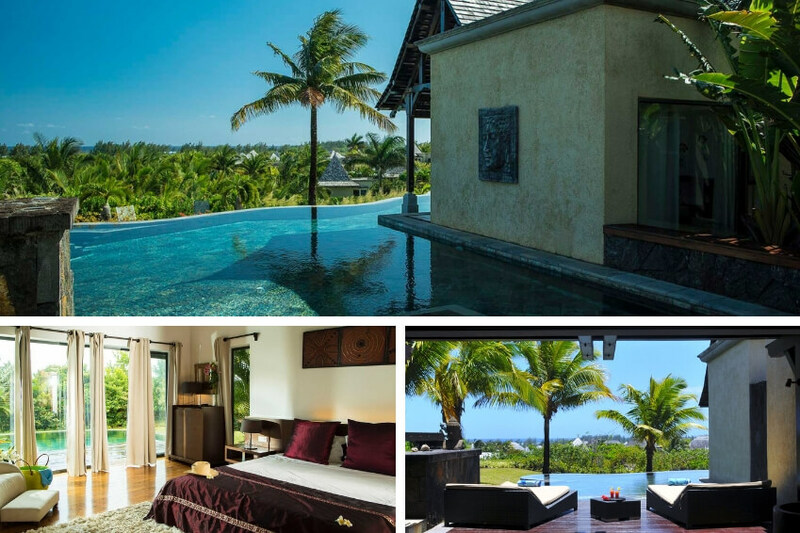 Located between two small villages in the South West of Mauritius, Bel Ombre and Chemin-Grenier, Villa Thalie promises you a local experience. 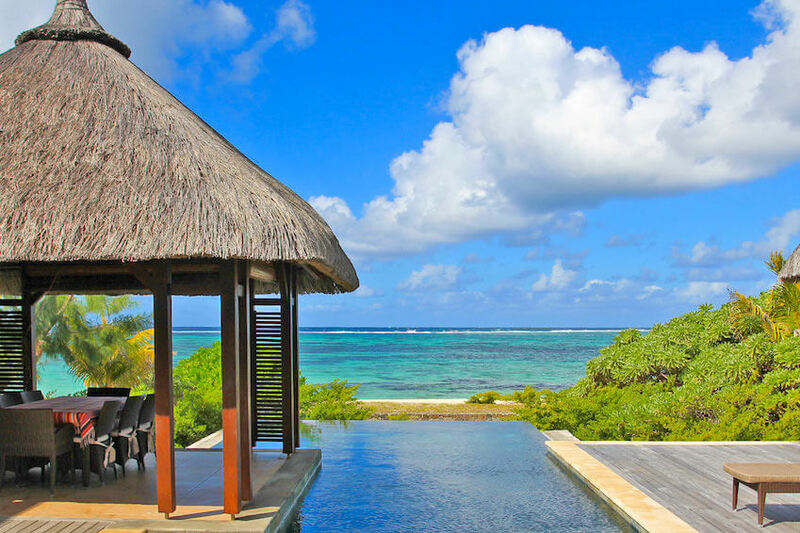 You will find an architecture and a contemporary decoration, but above all Mauritian. As for its panorama, it reveals you a splendid sight on the blue lagoon of the island and its coconut forests. The property brings together little corners of covered terraces, patios and wells of greenery with exceptional comfort, where you can spend pleasant moments: breakfasts, lunches, dinners, aperitifs ... Its spacious rooms - some among coconut trees, others at the edge of the pool - you will start your day on a right touch! Right in the middle of the Belle Rivière hotel domain, by the sea, the Cassiopée villa 31 offers you security and calm. Do not misunderstand, even though this luxurious property offers over 325 m² of luxurious living space, its common areas - lounges, dining room, and kitchen - occupy an entire wing that advocates a friendly lifestyle. Its infinity pool will allow you to indulge in laps in the middle of the coconut trees, its staff will be happy to answer to your needs, and its tennis court will delight you with fun games with your family. 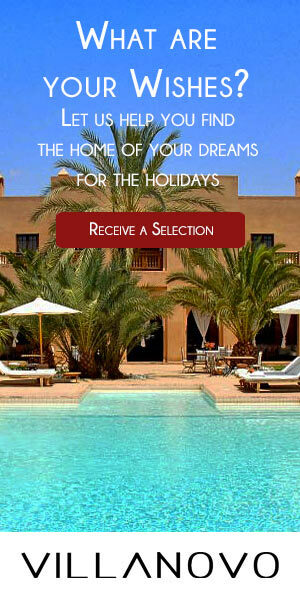 In short, Villa Cassiopée 31 promises you an unforgettable luxury holiday! 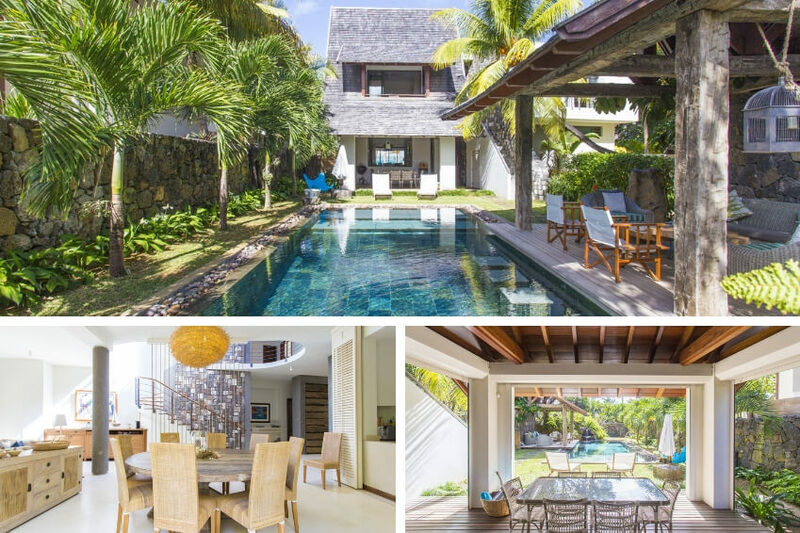 Combining charm and modernity, the villa Cambresi has all the necessary comfort for luxury holidays in Mauritius. Heated private pool, direct access to a beautiful white sand beach, house staff and cook, it is the promise of an exclusive experience. As for its view, you will find a variety of beautiful panoramas over the seasons: veranda facing the sea for summer, varangue garden view for the winter. In addition, the property is located near the local village of Trou d'Eau Douce, perfect to venture into an authentic Mauritian tour. >>> We present you the villa Cambresi here!